"Stitch" is a new sewing magazine coming out November 11 from the people at Quilting Arts (both published by Interweave Press). It looks like a pretty decent magazine for the modern sewer. There are a few project pictures on their site, but it would have been nice to see more of this preview issue...similar to what they do for Interweave Knits. If you pre-order the issue from the Quilting Arts site, you can save 10%. I will most likely buy this issue, but will probably wait to get a good look at it first. I haven't really found a sewing magazine yet I've liked enough to purchase a subscription for, but this one looks promising. For a while now, I had been trying to find the latest issue of Blueprint magazine. The new issue was mentioned on someone else's site (they actually had a copy), but couldn't find it anywhere. I finally found it at Target on Friday. I REALLY like this magazine...if more for its layout and asthetic than its articles. The articles are ok, but nothing earth-shattering. I just love looking at it. No wonder it is a Martha Stewart publication. This is only its third issue, but I might go ahead and subscribe ($15 for six issues - look for the card in the mag as it is more expensive to subscribe through the Web site (?). This issue kicks off their blog called "Bluelines." The blog has a list of entry catagories down the left-hand side to help you navigate the blog, and I like how the banners change for each category. Time will tell if it sticks around. 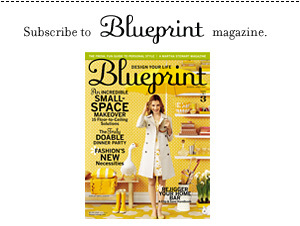 They do have a link on the blog that leads you to an electronic version of the very first issue of Blueprint. As you browse around, you can click on the pages to make them larger in order to read the text. I am not a big one for converting print publications to online documents, but they did a pretty good job with this one. Take a look. One little annoying note: Their magazine Web site has not been updated to reflect the new issue. Stale sites are a huge pet peeve of mine. I mean come on, they can pay extra people to update the site, so why not get that done when the issue hits the stands? If you are one of those people, like myself, who yearn for a room of their own, take a look at Heather Bailey's studio. 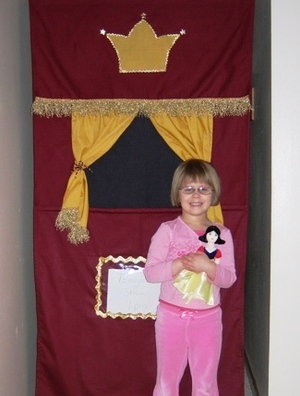 If I could shut my eyes and wish, I think my magic studio would probably look just like hers. Problem is I would probably sit there all day and marvel at its beauty rather than mess it up by crafting. 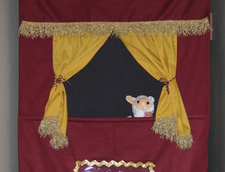 Chapter 2 of Hillary's Make-a-Long story will be up soon! Take a look at the upcoming patterns. Professor Paws is so charming! I need to get started on these before my Bean turns 18. Although, I hope she still appreciates these things when she is 18. And you never outgrow dolls with their own sleeping bags and backpacks...right? You have to see what Hillary of Wee Wonderfuls is up to next! I am so excited because I know many Beans who will love these little guys. It is going to be so much fun watching this develop. Not to mention how much fun it will be to bring them both to life! 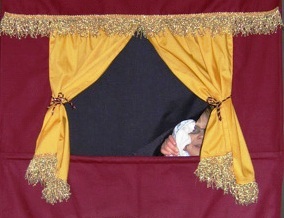 We were very fortunate last night to be treated to a puppet show. I really can't tell you much about the show as I was having a hard time following the plot, but it was very entertaining. From what I was told this morning, it looks like we will get to see another one tonight. And the best part is they are FREE! Cosmic Pluto Knits - Look for the free patterns in the right-hand column. I like them because they are all top-down and in the round..no sewing! Looks like she also sells her own handspun yarn. Bitty Booties - Pattern for the cutest little baby booties. From Hello, My Name is Heather (very cool crafty blog, by the way). Stockinette Cardigan for Wee Wonderfuls Kitty, Bunny or Bear - This pattern is for a little cardigan to fit the animals featured in Hillary's first pattern book. I bought the book a little while ago, and was so excited to see the sweater pattern. I am sure this pattern could be used for other little chilly animals as well. Fable Handknit - Very cute bobble hat pattern available...along with a great array of baby alpaca. Lace and Bobble Jacket - From Debbie Bliss's Wish You Were Here pattern book. This one may have been up for a while, but I just realized it was available. 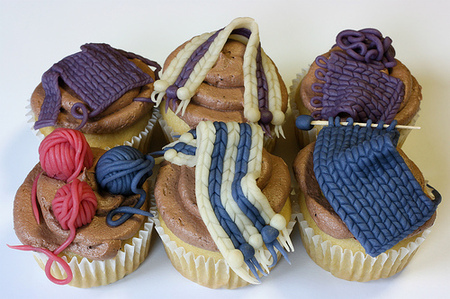 I love how it looks, but I doubt I would be able to get through that many bobbles without giving up. I bought this book a while ago, and I do like the other designs. Whip up had a recent entry about a blog devoted to design that just started a podcast. "a website dedicated to home and product design. 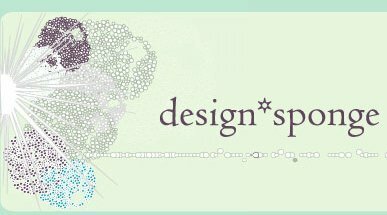 Launched in August of 2004, Design*Sponge features store and product reviews, sale and contest announcements, new designer profiles, and trend forcasting. In addition, Design*Sponge is dedicated to covering student design and international design shows (maintained by a team of student and international correspondents)." The site itself is just lovely, and the interviews look very interesting. I will definitely be adding this one to my list of weekly podcasts. About all things you do in your home, including decorating, eating, cooking, web shopping, crafting and fixer-upping. A filter to help you find the best voices, shops, products and on-line services for your home. A community, where you can ask questions of fellow homebodies, and share your own tips and ideas. Some great ideas here. Also, I love the rotating masthead!